Today is a Wednesday and a lot has happened since last month. 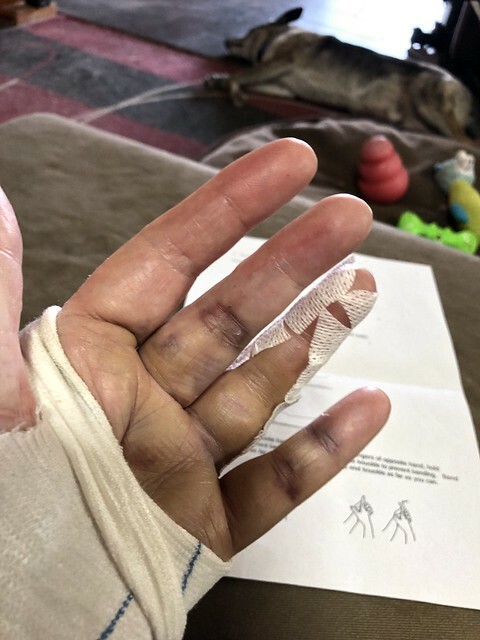 A simple thing like walking the dog 9 days ago resulted in 2 breaks in a finger (note to self, don’t loop dog lead around fingers/hand, especially when dog lunges) and surgery 5 days ago (3 screws and 2 screws holding the bones now) has put me in a hand splint. I woke during the night (as it becoming the norm with my hand) and looked in on a nesting pair of falcons in Melbourne via a webcam. David and I had a meeting organised for today in Adelaide (nothing to do with my hand) and he is driving me around. Afterwards we stopped in to see family (and I forgot to take a photo!) and then travelled back home in the city traffic. To see the 12 pictures click on an image to be taken to the album on flickr.